James Bernoski has been in health care for 18 years as a paramedic and registered nurse. His wife, Laural Strong, is an experienced registered nurse in critical care settings, including hospital emergency rooms. Laural also is an Air Force veteran with 12 years of service. With so much experience between them, James and Laural uncovered a gap in senior care options. To close this gap, James and Laural wanted to invest in a franchise that helped seniors recover from treatment and maintain their standard of living. In Amada Senior Care, they found a company that met their own high standards, and addressed the needs of their patient population. “Our passions always revolved around taking care of our patients,” James said. “Laural and I wanted to make a difference in the care gap happening for seniors. We wanted to make sure that seniors were being set up to be successfully discharged after they were treated in the hospital or rehab facility. "There was great communication from the team at Stearns Bank from the start. They were easy to talk with and not overbearing." James always had an entrepreneurial spirit. After discovering Amada, he knew that his dreams of being a small business owner were going to come true. James knew that he had to find the right financing fit to make the dream a reality. After working with his broker, he found Stearns Bank and SBA lender Mindy Campbell. 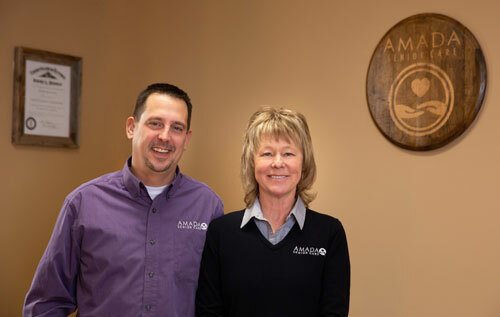 James and Laural wanted to lease space in an office building in Georgetown, Kentucky, for their Amada franchise. From the start of the SBA loan approval process, Mindy and the team at Stearns Bank walked James and Laural through each step. “There was great communication from Mindy and the team at Stearns Bank from the start,” James said. “They told us ‘we’ll walk you through this, but you also need to do your homework.’ They were easy to talk with and not overbearing." Amada Senior Care opened in Georgetown in April 2018. James and Laural have 18 employees and may expand to another location in the future. James and Laural wouldn’t hesitate to call Stearns Bank again if they needed another SBA loan. “I value transparency,” James said. “Stearns Bank never acted like it was better than us. They treated us with respect and dignity. They understood our goals and treated us like a person during the entire process.